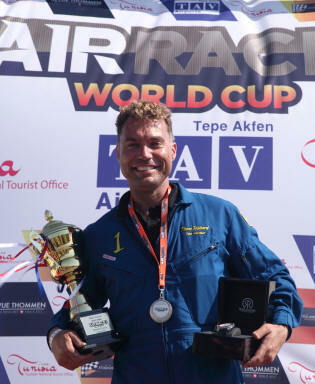 June 9, 2015 - Thom Richard of Sweden has claimed victory in the first round of the Air Race 1 World Cup held in Monastir, Tunisia, on 7th June 2015 in front of thousands of spectators. Richard flew across the finish line ahead of the pack at an average overall speed of 373 KPH in his unique airplane “Hot Stuff” to win the first-ever air race in Africa in what is known as the formula one air racing class. Richard had some difficulties with an overheating engine in the qualifying heat race on Saturday forcing him to pull out of the race and setting him back for the semi-final. The pit crew for Hot Stuff worked out the problem between races and Richard was able to fight his way forward in the semi-final, gradually overtaking some of the other favorites in a nail-biting finish to gain pole in the final round. The final race in Monastir was no disappointment, even after some of the most exciting and competitive racing the sport has seen. Local crowd favorite Jay Jones racing #45 came in second place showing off a series of innovative enhancements to his aircraft and Mike Mundell, a relative newcomer out of USA, in #33 proved himself a worthy series contender placing third overall.